The New Holland Honeyeater is mostly black and white, with a large yellow wing patch and yellow sides on the tail. It has a small white ear patch, a thin white whisker at the base of the bill and a white eye. This honeyeater is an active bird, and rarely sits still long enough to give an extended view. Sexes are similar in looks, but females are slightly smaller in size. Young birds are browner and have a grey eye. One very similar species is the White-cheeked Honeyeater. This species has a single large white cheek patch and a dark eye. The two species frequently occur together. 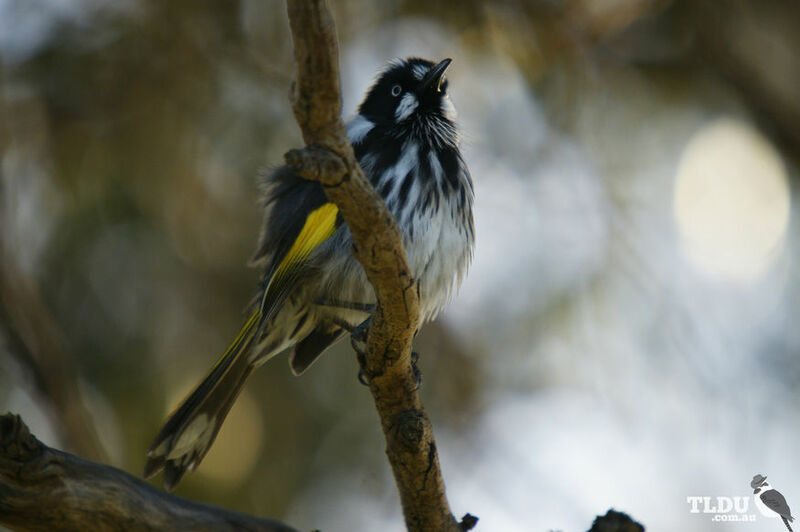 The New Holland Honeyeater's range extends throughout southern Australia, from about Brisbane, Queensland, to just north of Perth, Western Australia. The New Holland Honeyeater is common in heath, forests, woodland and gardens, mainly where grevilleas and banksias are found. It is inquisitive and approaches humans. It also mixes with other types of honeyeaters.